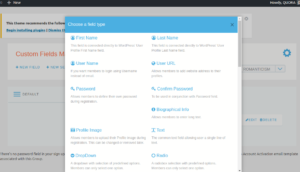 Fields manager allows for creation and management of the fields and pages of the signup form. 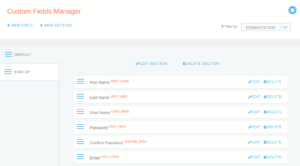 Fields manager can be accessed by clicking on “Fields” on the form card on Groups Manager page. Custom Fields Manager offers two main options in operation bar: NEW FIELD and NEW SECTION. 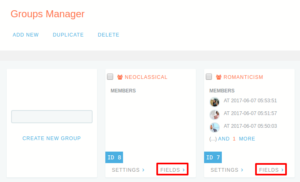 Also, there is a filter to chose from the available Groups to which section and its fields will be associated. Below the operation bar, page area is designed to show available sections on left hand side (there will be “DEFAULT” section available, if you haven’t added any yet), with corresponding available fields for that section on right side. In above screenshot, we have one default section and a single “User Email” field inside it. From simple information capturing to social network related data, fields allows a huge scope for flexibility and range on the forms. 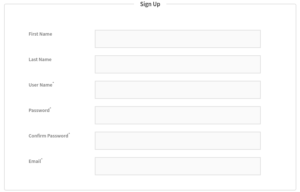 Using this form, visitors may sign up for the corresponding group. EDIT: Update the name and/or associated group for a section, and any of the attributes associated with the field. DELETE: Remove the section or the field. Caution is advised since this is an irreversible action.